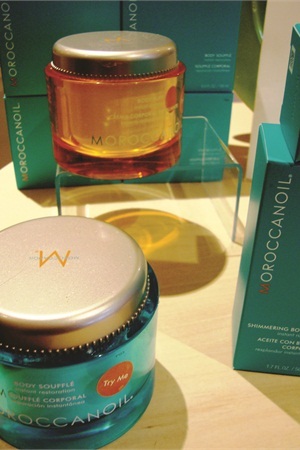 Moroccan oil is the hot cosmetic ingredient right now. And now it’s on display as the key ingredient of the Moroccan Oil Pedicure at MiniLuxe. Moroccan oil is the hot cosmetic ingredient right now. And now it’s on display as the key ingredient of the Moroccan Oil Pedicure at MiniLuxe (www.miniluxe.com), a Massachusetts-based chain of eight nail salons. “This upgrade is another luxurious way to soothe dry winter skin and bring back that summer softness and glow,” says Sue Thirlwall, MiniLuxe CEO. One of the salon’s most lavish pedicures, the client’s feet are first soaked in a jet-free, sanitary tub. Nails are cut or filed, cuticles and calluses are cared for, Moroccan Oil Body Buff is applied as an exfoliant, followed by an extended massage with Moroccan Oil Body Soufflé, and finished with a soothing spritz of Moroccan Oil Dry Body Oil. Finally, toes are polished to perfection. The pedicure lasts 60 minutes and costs $59.